Oscar Wilde was one of the most celebrated London playwrights of the 1890s. Before his imprisonment, Wilde produced several popular plays, including The Importance of Being Earnest, a comedy about switched identities. 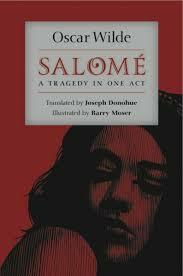 After writing two unsuccessful plays during the 1880s, Wilde found his voice with Salome in 1891. Salome, which was written in French, tells the story of the stepdaughter of the Biblical king Herod Antipas, the woman who asked for the head of John the Baptist (Jokanaan in the play) as her reward for performing the dance of the seven veils. The one act play was translated in English in 1894, and premiered on stage in 1896, by which time Wilde was in prison. Wilde then turned his literary talents towards critiquing Victorian society, writing Lady Windermere’s Fan in 1892, A Woman of No Importance in 1893, and An Ideal Husband in 1894. All of these were comedies, but had many themes related to the personal troubles Wilde was experiencing at the time. The Importance of Being Earnest, Wilde’s acknowledged masterpiece and final play, was written in late 1894 and performed in February 1895. The plot revolves around switched identities, in which the protagonists maintain separate personas in the town versus the country. Overall, the play manages to both capture and mock Victorian society. While the play was a triumph, Wilde would soon be jailed for indecency, his life and career ruined. Paper Masters writes custom research papers on Oscar Wilde Plays and examine the plays of one of the most celebrated London playwrights of the 1890s.